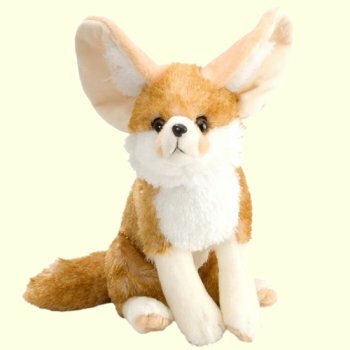 The Fennec is a small fox found in the Sahara Desert of North Africa (excluding the coast) which has distinctive oversized ears. Its name is derived from the Arabic word for "fox". The Fennec is the smallest canid, only weighing up to 1.5 kg. The animals are often a sandy color to blend in with their desert surroundings. Its ears, which are the largest in the canid family, serve to help dissipate heat. The coat can repel sunlight during the day and conserve heat at night. The soles of the feet are protected from the hot sand by thick fur. The Fennec is nocturnal. During the night, it will hunt for rodents, insects (such as locusts), lizards, and birds and only bird eggs. It also eats a small lizard known as a sandfish. The Fennec gets most of its water from food, but will sometimes eat berries and leaves as an additional source of water. Fennecs live in large dens (extending up to 10 meters), often with several foxes.